January 26, 2016 3:17 pm / 1 Comment on Accountants – Would an auto enrolment pre-assessment tool be useful? 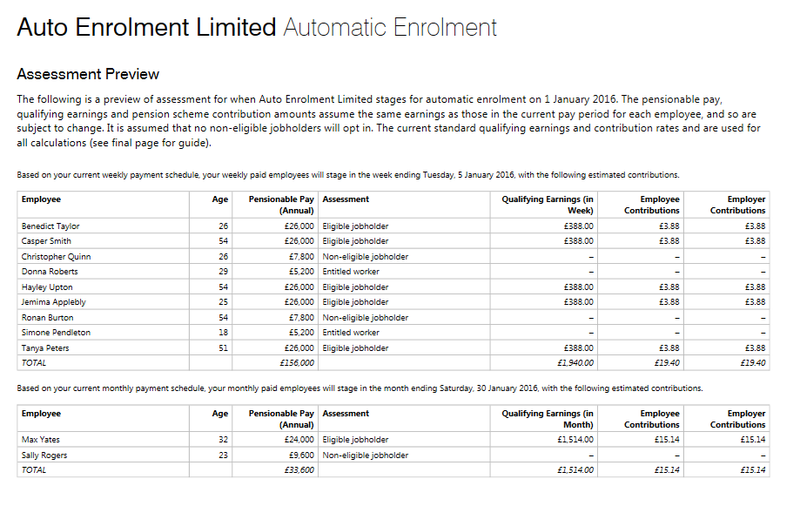 The pre-assessment tool uses employee details from the current pay period to provide an estimate of what auto enrolment might look like at the time of staging. The report will include details of each employee’s auto enrolment worker category, along with their pensionable pay, qualifying earnings, employee contributions and employer contributions. Watch BrightPay’s Pre-Assessment video. The amounts are subject to change, depending on non-eligible or entitled workers choosing to join the scheme and fluctuations in employee pay. The report can be exported to PDF and also includes some general information about employee assessment, including definitions of worker categories, qualifying earnings and minimum contribution rates. This is an ideal document to send to clients in advance of their staging date, giving them an idea of how much auto enrolment will cost them at each pay period thus allowing them to plan accordingly. For example, the report may show that the employer has no eligible jobholders, and so is not required to set up a pension scheme. BrightPay will also allow you to create a post-assessment report. After staging, the assessment report will give you a snapshot of what auto enrolment looked like on the staging date, highlighting the assessment date, the employee worker categories and postponed employees. Video: You can see how BrightPay’s pre-assessment tool works here. Another resource that can be used is BrightPay’s free auto enrolment webinars.These webinars are specifically designed for bureaus to make it easier to help payroll clients with their new obligations. BrightPay have a number of auto enrolment webinars scheduled for the remainder of this year, featuring various guest speaker, including Steve Pipe, Mike Foster, Darren Critten, AE in a Box, Trust Pensions, and Creative Auto Enrolment. ● Auto Enrolment – Are your Clients Ready? ● Darren Critten – Auto Enrolment – Collaboration is the key to success! ● Trust Pensions – How to choose a quality scheme and not get lost trying to navigate the auto-enrolment jungle. To find out more about upcoming webinars here. BrightPay is at the forefront when it comes to auto enrolment. 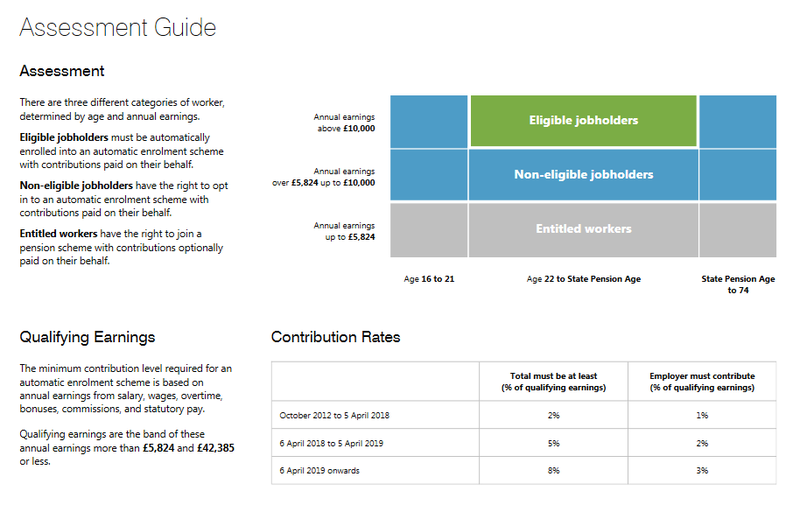 As well as the webinar series, bureaus can also make use of BrightPay’s free auto enrolment guides. BrightPay’s most recent guide, Bureaus are missing out on making a profit from AE, highlights practical steps that will ensure auto enrolment will be a smooth and profitable process. You can download it here. BrightPay is an integrated payroll and auto enrolment software solution that will allow you to streamline your client’s auto enrolment duties. New customers can now get 50% off a BrightPay bureau licence when you switch from a different payroll software provider. BrightPay’s bureau licence (normally £199 + VAT per tax year) includes unlimited employers, unlimited employees, auto enrolment functionality and free phone and email support. Now you can get this for £99.50 + VAT with no hidden costs. You can book a demo of BrightPay to see just how easily auto enrolment can be. You can also download a 60 day free trial with full functionality. *Offer applies to new customers who switch from a different payroll software provider to a BrightPay 2015/16 bureau licence for the first year subscription only. This does not work in conjunction with any other offer. The Pensions Regulator estimates that 1.8 million small and micro employers will reach their staging date within the next two years. These employers include an estimated 200,000 HMRC Basic PAYE Tools (BPT) users. To date, BPT users have not had access to software functionality that can help them carry out their auto enrolment duties. Assessing the workforce and calculating contributions manually could lead to errors, burden and non-compliance. Although free and low cost software is available to support auto enrolment, a high volume of BPT users are unlikely to switch to commercial software as many are concerned that they will be persuaded to buy additional products and services. Whilst there is no legal obligation to have software in place, it is evident that it improves employer compliance. The Pensions Regulator are working to release an auto enrolment toolkit by November 2015. As it is a government provided tool, some BPT users may assume that it is the most appropriate solution to use. ● It will not support multiple pay frequencies. ● It will not support variable contribution levels. ● It will use a tax-based pay reference period only. ● It will assume that the legal minimum entitlement is being used. ● It will calculate contributions based on banded qualifying earnings only. ● It will only support up to 15 workers. ● It will only support entitled workers if they are placed in an auto enrolment scheme on the same basis as other employees. ● It will not have postponement functionality. ● It will not have the ability to support re-enrolment. You can find a full breakdown of the limitations here. The auto enrolment toolkit will reduce the risk of both initial and ongoing non-compliance among BPT users. However, will it actually make the auto enrolment process easier? The Pensions Regulator encourages employers to use an integrated payroll and auto enrolment solution that will simplify and streamline auto enrolment. An integrated system, such as BrightPay, will allow you to save time and reduce workload. There is now a 50% discount for new customers who purchase a BrightPay 2015/16 standard licence when you switch from HMRC Basic PAYE Tools. A standard licence (normally £89 + VAT per tax year) includes unlimited employees, auto enrolment functionality and free support. Now you can get this for just £44.50 + VAT per tax year. BrightPay also has a free licence for micro employers with up to three employees, including support and auto enrolment functionality. You can now book a demo to see how BrightPay handles auto enrolment. The one-on-one online demo is done through an online screen sharing site and lasts approx. 20 minutes. Alternatively, you can download a 60 day free trial to try it out for yourself. * Offer applies to new customers who switch to BrightPay from HMRC Basic tools or another payroll software provider for the first year subscription only. This offer applies to BrightPay 2015/16 employer licences only and cannot be used in conjunction with any other offer. The webinar is ideal for employers who process their payroll in-house or are considering outsourcing it to a payroll professional. The session will help you understand what is involved for you and your business.